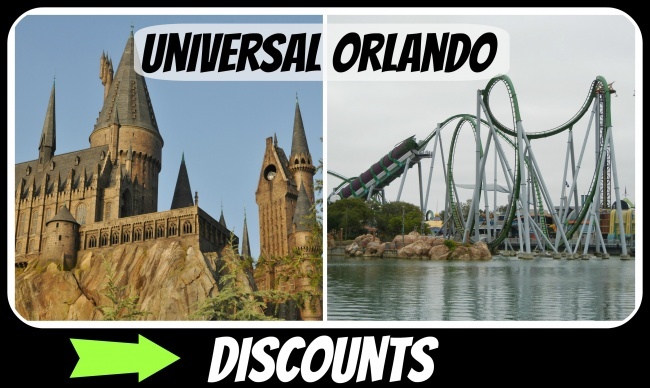 This Universal Orlando Resort Discounts page is brought to you with the help of our travel partner and Universal Specialist The Magic For Less Travel. Enhance your vacation package during the booking experience by adding Blue Man Group, Dining Options, Transportation and More! *Savings based on length of stay and valid only when purchasing a vacation package minimally including hotel and theme park tickets through Universal Parks & Resorts Vacations. Room type, hotel, and travel dates subject to availability. Offer valid on new bookings only. Valid for bookings now – 6/12/19 with travel 1/11/19 – 4/12/19, 4/28/19 – 6/30/19, 8/1/19 – 12/20/19. One offer per package, not valid with other discounts or promotions. Additional restrictions may apply. 4 night minimum required. Reservation must be made 72 hours in advance. 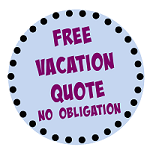 Travel must be completed by 6/30/19 to receive full savings. 1Tickets are non-refundable, non-transferable, and must be used by the same person on all days. Operating hours, prices, dates, times, attractions, and entertainment are subject to availability and to change without notice. Ticket excludes admission to separately ticketed events at either of the Universal theme parks or within any of the CityWalk venues. Some CityWalk venues require ages 21 or older for admission. Valid photo ID required. Does not include admission to Universal Cinemark, the Blue Man Group show, or Hollywood Drive-In Golf™. Subject to availability. Unless otherwise stated, parking is not included and there are no discounts on food or merchandise. Additional restrictions may apply and benefits are subject to change without notice. 3Airline tickets are non-refundable. In the event you make changes or rebook your vacation package, the original airfare paid may be applied toward a new ticket, subject to the airlines’ rules and regulations, as well as the payment of a re-ticketing fee and any differences in airfare amounts. In the event you cancel and do not rebook your vacation package, you will need to make any changes to future travel directly with the airline, subject to its rules and regulations, as well as payment of a re-ticketing fee and any differences in airfare amounts. Additional restrictions apply. 4Requires theme park admission. Valid at Universal Studios Florida and Universal’s Islands of Adventure. Not valid at Universal’s Volcano Bay or at Pteranodon Flyers™ at Islands of Adventure. Excludes separately ticketed events. Park-to-Park admission required to board the Hogwarts™ Express. Benefit valid only for guests of Loews Royal Pacific Resort, Hard Rock Hotel® and Loews Portofino Bay Hotel, for the number of guests staying in the room for the length of hotel stay. Available during normal theme park operating hours only. Additional restrictions may apply and beneﬁts are subject to change without notice. Save8 up to $100 when you visit all three theme parks. Take your vacation to the next level of awesome with the thrills and relaxation of Universal’s Volcano Bay™, a water theme park like no other. Plus, immerse yourself in blockbuster entertainment at Universal Studios Florida™ and journey through legendary worlds at Universal’s Islands of Adventure™. 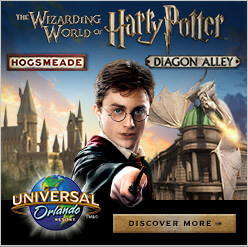 Create Your Own Vacation Package at Universal Orlando Resort. Compare hotels, theme park tickets, transportation options, flights and more. Universal’s Best Price Guarantee means you’ll enjoy the best package selection and value based on your travel dates and party size. Whatever options you choose, you’ll get special benefits like Early Park Admission to The Wizarding World of Harry Potter and Universal’s Volcano Bay one hour before the theme parks open (valid theme park admission required). The below pricing does not include airfare, ground transfers or additional components. A thrilling escape awaits your clients with hotel accommodations, Park-to-Park daytime admission to all three theme parks throughout their stay1 plus, for a limited time, admission to Halloween Horror Nights for any two Sunday-Friday event nights^^ (valid for bookings through June 5, 2019). R.I.P. Tour – This nighttime VIP tour starts at $191.69 per person. FREE4 Universal Express Unlimited™ ride access to skip the regular lines at participating rides and attractions at Universal Studios Florida™ and Universal’s Islands of Adventure™. That’s a value of $1295 per person, per day. Valid theme park admission required. Not valid at Universal’s Volcano Bay™ or for Halloween Horror Nights™. You’ll be right in the middle of the action as you navigate your way through the perils of the Gringotts vaults – encountering Harry, Ron and Hermione along the way! Afterwards, discover the exciting new dining and shopping locations within the new Diagon Alley! Plus, with the Park-to-Park admission ticket, vacation package guests can board the Hogwarts Express and travel between King’s Cross Station in Universal Studios Florida and Hogsmeade Station in Universal’s Islands of Adventure. 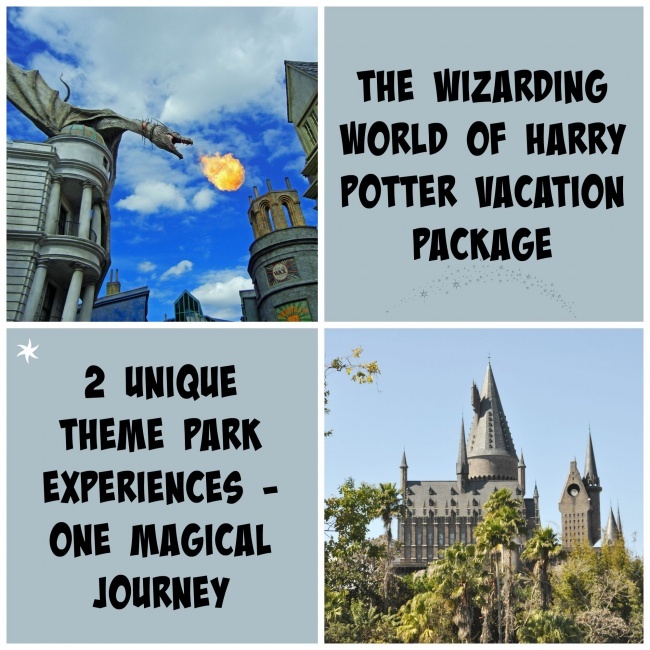 Purchase this exclusive vacation package and enjoy Early Park Admission to experience The Wizarding World of Harry Potter before the general public, Breakfast at the Three Broomsticks in Universal’s Islands of Adventure and at Leaky Cauldron in Universal Studios Florida, and More! Plus, enjoy hotel accommodations and admission to Universal Orlando Resort. TheMouseForLess Tip: When you book your Universal Orlando vacation package with The Magic For Less Travel, your travel counselor, in many cases will be able to make changes to your reservation, or add or subtract components, that cannot be done when self-booking on Universal Orlando’s web site. Packages are the same ones as booked on Universal’s web site and there is no charge for using their services! TheMouseForLess Tip: If the Wizarding World of Harry Potter Vacation Package is sold out, you can book the Create Your Own Package. The primary difference between this package is that the Breakfast at the Three Broomsticks is not offered with the 2 Park Getaway vacation package. FREE4 Universal Express Unlimited™ ride access to skip the regular lines at participating rides and attractions at Universal Studios Florida™ and Universal’s Islands of Adventure™. That’s a value of $129.995 per person, per day. Valid theme park admission required. Not valid at Universal’s Volcano Bay™. FREE† Universal Express Unlimited™ access to SKIP THE REGULAR LINES at favorite attractions in Universal Studios Florida™ and Universal’s Islands of Adventure™. That’s a value of up to $129.99†† per person, per day. Valid theme park admission required. Not valid at Universal’s Volcano Bay™. 1The 3-Park 4-Day Promo Base Ticket entitles one (1) guest admission to ONE (1) Universal Orlando Resort™ theme park per day: Universal Studios Florida™ OR Universal’s Islands of Adventure™ OR Universal’s Volcano Bay™. Ticket is valid for any four (4) calendar days during a seven (7) consecutive calendar day period which includes the first day any portion of the ticket is used. .This ticket also includes seven (7) consecutive calendar days of admission to select live entertainment venues of Universal CityWalk™ which commences and includes the first day any portion of the ticket is used. Ticket excludes admission to separately ticketed events at either of the Universal theme parks or within any of the CityWalk venues. Some CityWalk venues require ages 21 or older for admission. Valid photo ID required. Unless otherwise stated, does not include admission to Universal Cinemark, the Blue Man Group show, or Hollywood Drive-In Golf™. Subject to availability. Parking is not included and there are no discounts on food or merchandise. To receive full benefit of the ticket entitlements, first use of this ticket must be on or before June 27, 2019. All ticket usage must be completed on or before June 30, 2019 when the ticket will expire in full. Unused days will be forfeited. BLOCKOUT DATES December 26 through and including December 31, 2018 will apply to this ticket. This ticket will be sold only within the U.S. and Canada between September 14, 2018 and March 14, 2019. Additional restrictions may apply and benefits are subject to change without notice. 8The 3-Park 5-Day Base Ticket entitles one (1) guest admission to ONE (1) Universal Orlando Resort™ theme park per day: Universal Studios Florida™ OR Universal’s Islands of Adventure™ OR Universal’s Volcano Bay™ Water Theme Park. Ticket is valid for any five (5) calendar days during a seven (7) consecutive calendar day period which includes the first day any portion of the ticket is used. This ticket also includes seven (7) consecutive calendar days of admission to select live entertainment venues of Universal CityWalk™ which commences and includes the first day any portion of the ticket is used. The ticket will expire in full on the expiration date printed on ticket. Unused days shall be forfeited. Ticket excludes admission to separately ticketed events at either of the Universal theme parks or within any of the CityWalk venues. Some CityWalk venues require ages 21 or older for admission. Valid photo ID required. Does not include admission to Universal Cinemark, the Blue Man Group show, or Hollywood Drive-In Golf™. Subject to availability. Unless otherwise stated, parking is not included and there are no discounts on food or merchandise. Additional restrictions may apply and benefits are subject to change without notice. *Promotional Vacation Package rates are per person, per night, tax inclusive and based on two (2) adults and two (2) children (ages 17 and under) on a 5-night length of stay at a Universal Partner Hotel in a standard room with a 3-Park 4-Day Promo Base Ticket per person. Tickets are valid for admission to ONE (1) Universal Orlando Resort™ theme park per day: Universal Studios Florida™ OR Universal’s Islands of Adventure™ OR Universal’s Volcano Bay™. Ticket is valid for any four (4) calendar days during a seven (7) consecutive calendar day period which includes the first day any portion of the ticket is used. Promotional rate is based on Rosen Inn International. Rates and discounts vary by hotel, length of stay, room type, travel dates, season and are subject to availability. Rate valid for bookings now – 11/30/19 and travel 1/1/19 – 4/14/19, 4/24/19 – 10/3/19, 10/6/19 – 10/10/19, 10/13/19 – 10/17/19, 10/20/19 – 10/24/19, 10/27/19 – 12/20/19. 4 Night Minimum Required. Must present Canadian Driver’s License or Identification Card at check-in. Reservation must be made 72 hours in advance. The number of rooms available at this rate is limited. Additional rates and travel dates are available. ***Promotional Vacation Package rates are per person, per night, tax inclusive and based on two (2) adults and two (2) children (ages 17 and under) on a 5-night length of stay at a Universal Orlando Resort Hotel in a standard room with a 3-Park 4-Day Promo Base Ticket per person. Tickets are valid for admission to ONE (1) Universal Orlando Resort™ theme park per day: Universal Studios Florida™ OR Universal’s Islands of Adventure™ OR Universal’s Volcano Bay™. Ticket is valid for any four (4) calendar days during a seven (7) consecutive calendar day period which includes the first day any portion of the ticket is used. Promotional discount rate is based on savings from Value 1 Length of Stay rates at a Universal Orlando Resort Hotel; Universal’s Endless Summer Resort – Surfside Inn and Suites (Opening July 11, 2019). Rates and discounts vary by hotel, length of stay, room type, travel dates, season and are subject to availability. Rates are valid for bookings now – 12/11/19 and for stays most nights Sunday–Thursday; 8/25/19 – 9/26/19, 12/1/19 – 12/19/19. Rates are higher on Friday, Saturday and holiday nights. 4 Night Minimum Required. Must present Canadian Driver’s License or Identification Card at check-in. Reservations must be made 24 hours in advance. The number of rooms available at these rates are limited. Additional rates and travel dates are available. **Promotional Vacation Package rates are per person, per night, tax inclusive and based on two (2) adults and two (2) children (ages 17 and under) on a 5-night length of stay at a Universal Orlando Resort Hotel in a standard room with a 3-Park 4-Day Promo Base Ticket per person. Tickets are valid for admission to ONE (1) Universal Orlando Resort™ theme park per day: Universal Studios Florida™ OR Universal’s Islands of Adventure™ OR Universal’s Volcano Bay™. Ticket is valid for any four (4) calendar days during a seven (7) consecutive calendar day period which includes the first day any portion of the ticket is used. Promotional discount rate is based on savings from Value 1 Length of Stay rates at a Universal Orlando Resort Hotel; Universal’s Cabana Bay Beach Resort, Universal’s Aventura Hotel, Loews Sapphire Falls Resort, Loews Royal Pacific Resort, Hard Rock Hotel®, and Loews Portofino Bay Hotel. Rates and discounts vary by hotel, length of stay, room type, travel dates, season and are subject to availability. Rates are valid for bookings now – 12/11/19 and for stays most nights Sunday–Thursday; 1/21/19 – 2/14/19, 8/25/19 – 9/26/19, 12/1/19 – 12/19/19. Rates are higher on Friday, Saturday and holiday nights. 4 Night Minimum Required. Must present Canadian Driver’s License or Identification Card at check-in. Reservations must be made 24 hours in advance. The number of rooms available at these rates are limited. Additional rates and travel dates are available. If you only have one day, this is the best way to experience most of Universal Studios Florida™ and Universal’s Islands of Adventure™. You’ll get to skip the regular lines an unlimited number of times at most of your favorite rides and attractions, including The Amazing Adventures of Spider-Man®, Despicable Me Minion Mayhem™ and The Wizarding World of Harry Potter™. So you can fit way more fun into your day. Date selection is required before entering ticket quantity. There are only a limited number of passes available for sale for each date. Not valid for separately ticketed events, such as Halloween Horror Nights™ or Rock the Universe™. Limit eight (8) tickets per transaction. Your ticket may not be copied, transferred, or resold. Tickets are non-refundable. Parking is not included. NOTE: Applicable sales tax will be added to all ticket products. Entitle one (1) guest admission and unlimited Universal Express ride access to BOTH Universal Studios Florida AND Universal’s Islands of Adventure on the same day. Express ride access is a separate queue line with a shorter wait time at participating rides and attractions. Ticket will be valid for the number of days selected (as indicated on the ticket) and must be used within seven (7) consecutive calendar days which commences and includes the first day any portion of the ticket is used. Multi-Day tickets also include seven (7) consecutive calendar days of admission to select live entertainment venues of Universal CityWalk which commences and includes the first day any portion of the ticket is used. This is not included with the 2-Park 1-Day Park-to-Park + Universal Express Unlimited Ticket(s). Ticket will expire in full on the expiration date printed on ticket. Unused days will be forfeited. Universal Express Unlimited ride access allows you to bypass the regular lines an unlimited amount of times by providing express ride access to most attractions at both Universal Studios Florida and Universal’s Islands of Adventure theme parks on the selected calendar day(s). Valid at participating attractions only. Universal Express Unlimited is not valid at select attractions and separately ticketed events. There are only a limited number of Universal Express Unlimited passes available for sale for each date. Limit ten (10) total admission tickets per transaction. All tickets specifically exclude admission to separately ticketed events at any of the Universal theme parks or within any of the CityWalk venues. Some CityWalk venues require ages 21 or older and a cover charge for admission. Valid photo ID required. Does not include admission to Universal Cinemark, the Blue Man Group show or Hollywood Drive-In Golf™. Unless otherwise stated, parking is not included and there are no discounts on food or merchandise. Take your vacation to the next level of awesome with the thrills and relaxation of Universal’s Volcano Bay™, a water theme park like no other. Plus, immerse yourself in blockbuster entertainment at Universal Studios Florida™ and non-stop excitement at Universal’s Islands of Adventure™. Experience it all with this amazing vacation package. Universal Orlando Resort™ has teamed up with Royal Caribbean International® to offer an exclusive vacation package you clients won’t find anywhere else. You can enjoy an adventure on one of Royal Caribbean’s innovative ships, PLUS you can experience the excitement of Universal Orlando Resort’s two amazing theme parks, spectacular on-site hotels, unique dining and entertainment, and more, all in one incredible family vacation. Please contact a Magic for Less Agent for a free quote!